Celestron's NexStar 127SLT Mak computerized telescope. Amazon Prime Day offers lots of chances for skywatchers to upgrade their equipment. 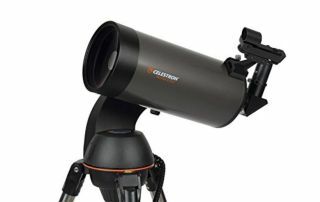 One of the deals on offer today (July 11) is theCelestron NexStar 127SLT Mak computerized telescope. The 5-inch (127 millimeters) scope normally sells for $459, but you can get it at $343.19 (38% off) unti 3:05 p.m. EDT (1905 GMT). Why it's a good deal: The NexStar 127SLT Mak is a comes with a quick-release mount, planetarium software and an object-locating finderscope, among other goodies. It is part of Celestron's seasoned NexStar line of GoTo telescopes designed to automatically find targets to streamline viewing time. Its 127-mm aperture great for viewing the surface of the moon, phases of Venus, rings of Saturn or Jupiter and its four largest moons, according to Celestron. And while we're featuring the Maksutov-Cassegrain version of the NexStar 127SLT, Amazon does have more affordable Refractor and Newtonian versions available, as well as a smaller 90-mm SLT Maksutov. The deal is available today only to Amazon Prime members.